Our AP Environmental Science class at The Thacher School was split into groups, each researching a different topic using aerial mapping and photography. Our group was tasked with the investigation of the effectiveness of our school's bioswale. A bioswale is a landscaping feature that funnels nutrient-heavy runoff water through the utilization of dense vegetation as a means of filtration. Here at Thacher, our bioswale is located in an area known as Carpenter's Orchard. As a result of a year-round presence of horses, large amounts of horse manure have accumulated, which is believed to have a significant environmental impact: as rainwater passed through Carpenter's Orchard, it collected high levels of nitrogen from the nutrient-rich manure, which then flowed directly into an adjacent creek. In an effort to reduce this runoff, several Thacher students undertook the task of constructing this bioswale. In order for the bioswale to be completely effective, it must have an ideal amount of water flow --neither too great nor too little-- so that vegetation can provide its critical service. Over the course of our research, we sought to answer the question: is the bioswale an effective buffer? By using aerial mapping, gathering information about erosion and water flow through the bioswale based on the abundance of vegetation and other factors was made easy, as we were able to attack multiple angles in multiple flights. For our project, we used one large red rubber balloon, helium, two velcro straps, a Nikon Coolpix s4300 camera, a rubber band harness system for the camera, a camera housing made using public lab's instructional video (Rubber band and PET bottle camera rig), and one small carabiner. We used the following website to research bioswales: Bioswale information. To hold down the shutter button, instead of using a rock as recommended, we chose to wedge a small twig in between the housing and the button. This worked for us as it was quicker and more effective than taping a pebble. 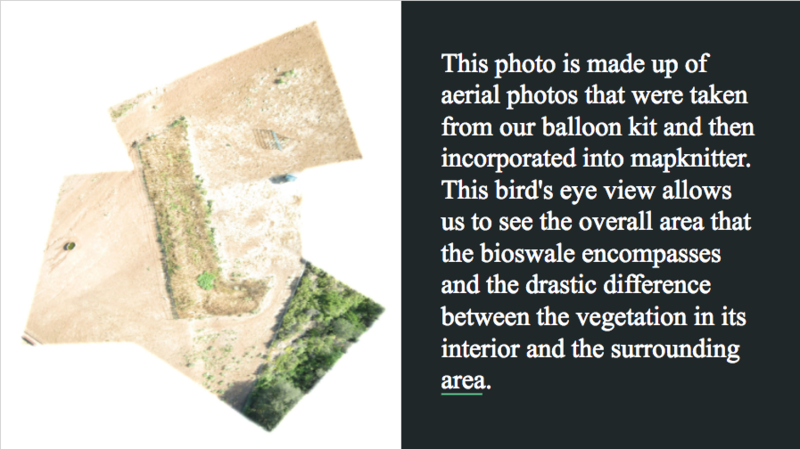 We were able to launch the balloon within feet of the bioswale, which allowed us to gather more precise images and move the balloon to the locations we wanted it to be in. Immediately, upon looking at our data, we found, as we could also see from the ground, that the bioswale contained a much higher density of vegetation than the surrounding areas. More water flowing through the bioswale has led to this, a strong sign that it is truly effective. Furthermore, looking at the surrounding erosion patterns, it was evident that most water flow from higher on the slope was channeling in the bioswale, with some excess runoff going elsewhere. In our investigation, we found that there are certain things that could be improved. Our equipment was satisfactory, but the external forces of wind, the slow process of launching a balloon and maintaining the balance of the camera housing led us to wonder if a cheap drone might be more effective in capturing images. However, overall, the process was quite simple and an effective way of gathering data and we would recommend the public lab kit to anyone who wishes to pursue environmental mapping.